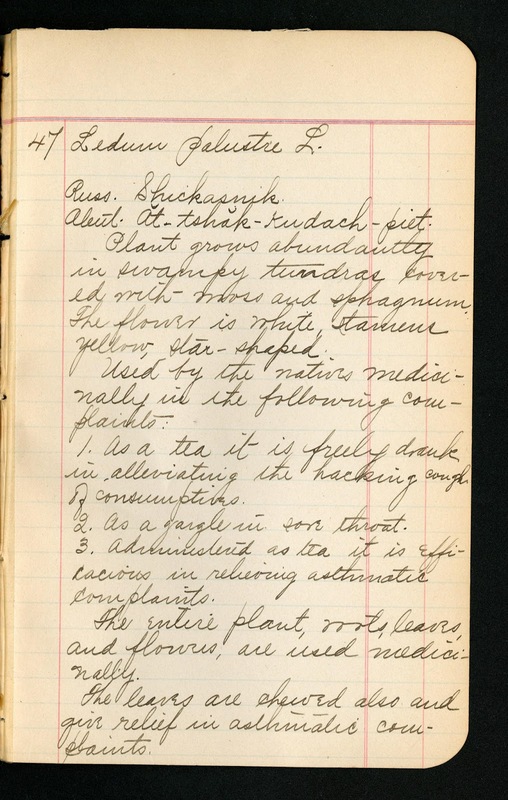 Fisher's notebook documents his final years collecting and looks at the relationship between the Alutiiq (Aleut) and their plants by recording medicinal and food uses for 48 specimens. Only a handful of the specimen entries include the taxonomic names of plants; instead, entries focus on recording the Russian and Sugpiat/Alutiiq names of plants, how the plants were used, and plant distribution. Detail varies, as seen below in entries three and forty-seven. Specimen entry three from "Notes accompanying collection of useful plants made by W. J. Fisher at [Kodiak] in 1899," Smithsonian Institution Archives, SIA Acc. 12-038. http://www.biodiversitylibrary.org/page/46428854. Digitized by Smithsonian Institution Archives. 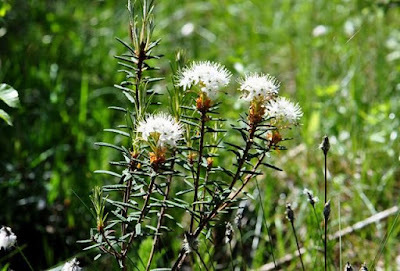 Entry forty-seven for Ledum palustre [Rhododendron tomentosum], also known as Northern Labrador Tea (also pictured below), takes up an entire page describing the plant's habitat, the appearance of its flowers, and multiple local medicinal applications: "(1) As a tea it is freely drunk in alleviating the hacking cough of consumptives. (2) As a gargle in sore throat. (3) Administered as tea it is efficacious in relieving asthmatic complaints." Specimen entry forty-seven, from "Notes accompanying collection of useful plants made by W. J. Fisher at [Kodiak] in 1899," Smithsonian Institution Archives, SIA Acc. 12-038. http://www.biodiversitylibrary.org/page/46428831. Digitized by Smithsonian Institution Archives. Fisher's ethnographic focus while collecting plants is clear. The field book provides detailed information regarding local names and knowledge, but leaves out basic information often found in botany field books like date and detailed locality information. This lack of information may relate to a note Fisher wrote on the title page: "dried plants with Mr. Kearney, alcoholics in seed collection." "Mr. Kearney" was Thomas Henry Kearney (1874-1956), a botanist with the Bureau of Plant Industry at the US Department of Agriculture (USDA). Kearney was in Alaska to work with Frederick Coville from April 1898 - August 1899, and along the Northwest Coast from Puget Sound to the Bering Strait in 1899. He then served as a member of the Harriman Alaska Expedition of 1899. It is unclear how the two men became acquainted. Fisher had a relationship with the Smithsonian Institution; Coville as a USDA employee worked with Smithsonian, and perhaps he introduced the two. 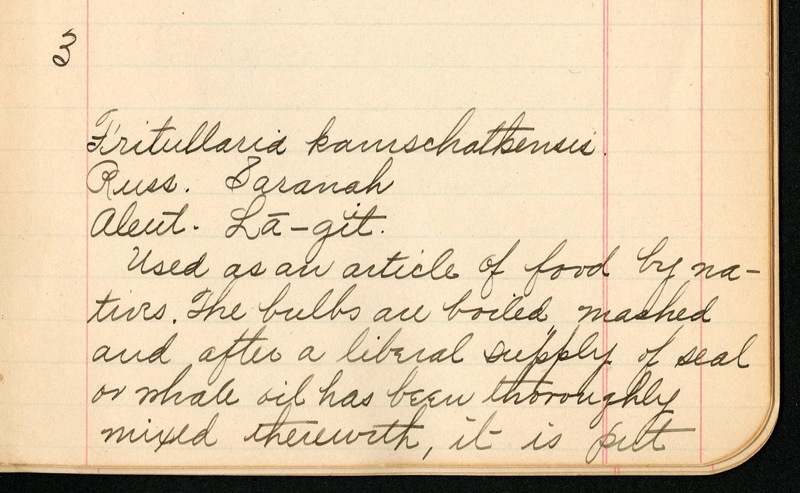 Whatever the reason, Kearney's field notes for his work in Alaska are also available on BHL through the Smithsonian Field Book Project, and they provide a tantalizing overlap in content and geographical coverage. Fisher's field book is also interesting because it document's his collecting focus and interests as they evolved over a lifetime. Fisher’s initial scientific interest was in marine biology. During the 1870’s he was a curator of conchology at the California Academy of Sciences and served as a marine biologist for the U.S. Fish Commission on several cruises in the Pacific headed by William Healey Dall. *Cue the peals of thunder and blood curdling scream! An example of pressure sensitive tape over text from “Field notes, specimen no. 1-2579, Idaho, Oregon, Utah, Virginia, Wyoming, Alaska, and Canada, 1898-1899.” Smithsonian Institution Archives. SIA Acc. 11-253, Frederick Coville, field books, 1890-1924. Image courtesy of Andrea Hall. Luckily, as a conservation professional, I have a variety of tools to combat the menace of tape and all its perils. Initially, I like to run a series of tests to see which method will help me remove the tape most easily. I pick an inconspicuous sample area for testing with removal methods like a hot air pencil or a poultice to remove the top, non-sticky layer of tape, called the carrier, and swell the adhesive. All this while shouting, “THE POWER OF CONSERVATION COMPELS YOU!” at the tape, of course. Again, ordinarily, this is fairly uncomplicated, with the tape responding to certain treatments depending on its composition and age. However, in this case, even after testing with a variety of removal methods, this tape wouldn’t budge. So, I turned to the most important tool in a conservator’s belt, patience… and solvents. The solvent chamber in action. From “Field notes, specimen no. 1-2579, Idaho, Oregon, Utah, Virginia, Wyoming, Alaska, and Canada, 1898-1899.” Smithsonian Institution Archives. SIA Acc. 11-253, Frederick Coville, field books, 1890-1924. Image courtesy of Andrea Hall. I created a localized solvent chamber using a piece of blotter suspended in a glass jar and dampened with solvents carefully tailored to solubilize the chemical components of the tape. This allows for a targeted dose of solvent to the tape without subjecting the rest of the page to the solvent or the lab to the fumes involved with their use. To ensure my safety and that of my coworkers, I did everything in the fume hood. Once the solvent chamber was placed, I simply had to allow it to do the work. It facilitated an easier removal of the tape, though it still left a layer of adhesive residue behind, which was picked up with swabs. Removing residual adhesive with swabs. From “Field notes, specimen no. 1-2579, Idaho, Oregon, Utah, Virginia, Wyoming, Alaska, and Canada, 1898-1899.” Smithsonian Institution Archives. SIA Acc. 11-253, Frederick Coville, field books, 1890-1924. Image courtesy of Andrea Hall. Once I found a removal solution that worked, I could proceed, but it was a long and careful process with the tape sometimes trying to fend off my exorcism. Eventually, it was removed from the many, many pages of the field book, and I was able to mend the pages with Japanese tissue and wheat starch paste and rebind it using a sewn boards binding, which I’ll write more about in a future post. Now that the tape is gone, the peals of thunder and shrieking have died down, and it’s a much more stable field book, ready for digitization and use by researchers. The front of the sewn boards binding. From “Field notes, specimen no. 1-2579, Idaho, Oregon, Utah, Virginia, Wyoming, Alaska, and Canada, 1898-1899.” Smithsonian Institution Archives. SIA Acc. 11-253, Frederick Coville, field books, 1890-1924. Image courtesy of Andrea Hall. The spine of the book, following re-binding. From “Field notes, specimen no. 1-2579, Idaho, Oregon, Utah, Virginia, Wyoming, Alaska, and Canada, 1898-1899.” Smithsonian Institution Archives. SIA Acc. 11-253, Frederick Coville, field books, 1890-1924. Image courtesy of Andrea Hall. Page 74 of Bohumil Shimek's "Diary, European trip, 1914 (2 of 2)". Smithsonian Institution Archives. SIA RU007082, Box 3 Folder 4. Page 190 of Bohumil Shimek's "Diary, European trip, 1914 (2 of 2)". Smithsonian Institution Archives. SIA RU007082, Box 3 Folder 4. Arose at 6 o’clock. A misty, somewhat windy morning. (Supplementary notes) While we were at London Mr. Washa had meetings with Mr. Kopesky and other local Bohemians, and a police commissioner with officer called on him to investigate. The English are very careful. Of course Mr. Voska had no trouble to show who he is, as he is a “Times” correspondent. The English have also been watching us closely, but we move about here with a different feeling, as we are among friends. The bearing of the Englishman is less overbearing, and indeed the entire atmosphere is different. We are congratulating ourselves that we are out of the oppressive atmosphere of Austria, and of bullying, insolent Germany. The boasted “culture” of Germany is certainly displaying itself! We see bodies of soldiers marching down the streets, and we have seen a few small camps in the country on our way here, but on the whole there does not seem to be any visible effect produced on the activities of the people. There is not that absence of men so noticeable in Austria and Germany, and evidently the English have not more than commenced to use their resources. This promises that England will have the final say in the decision of the great conflict vehicle which is sweeping the world. [Page 103] In Liverpool (and London) I was struck with the large number of women employed everywhere. There are sales girls in almost every business, the fishmarkets, vegetable and fruit markets, etc., are conducted by them, there are bar maids in hotels, and I presume in drink shops generally, and everywhere they are in evidence. They sell papers on streets, etc. The fishmarket at Liverpool is interesting. I visited it yesterday. The most common fish is the flounder. There are also eels, and a number of fishes which I do not recognize. Also crabs, lobsters, shrimps, oysters, claws, periwinkle, etc. What of this is cheap food, and such a market must be a blessing. We left the dock at 5:30 P.M., but delayed a long time before really going out. We are trying to sleep in the 2nd Cabin smoking room. We have a good many German Americans on board, and most of them are German sympathizers, as might be expected. I found one exception, a New York German who says that [page 104] he has been in America 43 years, and this is his first visit, and he says that he will never go back. He came from Eastern Prussia, and saw the Russian invasion. When we were on the tender Mrs. Cerny made the remark that we had our hardest time going through Germany. An old German (from St. Louis?) flared up when his daughter (?) told him what Mrs. C. had said, and declared that it was some “damned lies,” and he was not a German! I told him that we know what we had experienced, and he did not. Things quieted down, but it is evident that there is much subdued German sentiment aboard. We’ve come across a wide variety of images while cataloging field books. Some clearly document specimens, observations of habitat, candid interactions of colleagues, and others we have yet to determine the reason. Some of my favorites are the images that seem clearly taken for one purpose until one reads the collector’s caption. We have several of these. Often these images look like pictures that could be found in any family album. Some include children or show general landscapes. They may appear quite pedestrian, until one reads the caption, and realizes the “why.” Below are a few examples. The first could pass as a picture of the family farm, the next possibly an image of long lost relatives, but each is providing important information to the scientists who included the photos in their field documentation. Curious to see more? Check out Field Book Project Flickr sets on Smithsonian’s Flickrstream. Fertility erosion on ridge tops, 15 miles southwest of Pullman, Washington, March 1953. Smithsonian Institution Archives. RU 7279, Box 29, Folder 1, Envelope 16. SIA2014-00010. Near view of native vegetation on sand-steppe near Heidesheim, Germany, 1914. Smithsonian Institution Archives. RU 007082, Box 5, Folder 1. SIA2012-3229. Mary Agnes Chase's Field Work in Brazil, Image No. 1935. Cutting Stenotaphrum at Dr. Rolf's, Vicosa. Smithsonian Institution Archives. RU 000229, Box 20, Folder 1. SIA2012-3351a. Bartschella schumannii Britton & Rose. Collected by J. N. Nelson in Northwest Mexico, on March 23, 1911. USNM 638432. Courtesy of Botany Department, National Museum of Natural History. Recently, the Field Book Project made available some of botanist Joseph Nelson Rose’s field books for volunteers to transcribe on Smithsonian’s Transcription Center. To highlight this new content, the Field Book Project would like to provide readers with a little more background about the scientist and the man. Over the last three years we have frequently written blog posts highlighting personal interests and interesting facets of the collectors’ lives. J. N. Rose was a botanist with the USDA and Smithsonian Institution. He traveled extensively through the American tropics, co-wrote important botanical texts, and collected extensively for the National Herbarium. When I prepared to write this piece, I anticipated the writing would be a fairly easy task. Though he had a full and active career, I found little that described the scientist himself. What I did find, described a man that seemed to be well regarded and hardworking; he did not readily seek attention for himself. A good amount of his botanical work was even completed in collaboration with others. He co-wrote with at least 12 other botanists. The few articles I found that offered any personal description of Rose made me wish more information was available. William Trelease wrote in a 1928 issue of Science about his colleagues’ response to the death of Rose. He wrote that the staff of the US National Museum was called by the Secretary of the Institution, Charles Greeley Abbot, to gather in order to show their appreciation. To those of us who listened, as speakers rose here and there in the room, the kindly personality of a friend and a talented devotion of an able man in earnest work unfolded. To those of us that spoke, the sadness of the occasion was blended with the consolation born of the knowledge that a well-rounded-out life had come to ripe fruition. The article continues to elaborate about the diligent and conscientious lifelong work of Rose, but gives few details about the personal life of a man and scientist who was obviously appreciated and admired by his colleagues. His spirit of cooperation and belief in the importance of scientific discovery seems a perfect complement to the work of the transcription center volunteers. Transcribing makes these materials and their contents accessible and useable in a host of new ways. We encourage you to take a look through his and the other field books now available online from Smithsonian. Loess bluffs above Aftonian gravel and Nebraska drift. S. of Turin, IA. Smithsonian Institution Archives. RU 7082 Box 5 Folder 3 Aftonian Gravel 379. Chances are, few of you reading this piece can define or describe a “loess.” I certainly could not, and thus referred to The American College Dictionary on my shelf (1970 edition.) Accordingly, a loess is “a loamy deposit formed by the wind, usually yellowish and calcareous, common in the Mississippi valley and in Europe and Asia.” To the untrained eye, a loess may simply appear as an ordinary hill, perhaps created by a glacier or a body of water long since receded. Such an assumption would be logical if there was additional evidence of glacier deposits or the presence of a shoreline nearby. However, what if the “hill” occurred in the plains of the United States, were the land is predominantly flat, there is no evidence of glacier movement, and no shoreline for hundreds of miles? This drawing is from RU 7082, Box 2, Folder 26, and pertains to a Loess site in Shelby County, Iowa, September 2, 1913. This drawing, though crude, documents different soil levels and the composition of a particular Loess Hill. There are other interesting historical bits as well, such as itemized lists of expenses for travel, lodging, and meals. The costs of the aforementioned are quite a contrast to present day. Travel was mostly by rail, however, there are entries for bicycle rentals, something you would scarcely find in expense records generated today. Expenses recorded by Shimek, 1909. Smithsonian Institution Archive. RU 7082, Box 2, Folder 21. Shimek’s field notes include many types of details beyond field work, like travel expenses, cities/town he traveled through, railroad expenses, meals, etc. Loess ridge near Turin, Ia. "Cat-steps" in foreground. Smithsonian Institution Archives. RU 7082 Box 5 Folder 3. This photograph clearly demonstrates the “ripple effect” wind has on soil over a prolonged period. We hold two collections of Shimek papers. The previously mentioned Record Unit 7082: Bohumil Shimek Papers, 1878-1936, which is the primary collection, and Accession 91-027: Bohumil Shimek Papers, 1882-1936, which is an addition to Record Unit 7082. The University of Iowa Libraries also holds a collection of Bohumil Shimek Papers. I only recently have had cause to review our two collections of Bohumil Shimek Papers, and I have tremendous respect for him. The more I learn about Shimek and the deeper I dig into his papers, it becomes clear that he was enthusiastic about his work, and very concise and thorough with his observations and field notes. Shimek traveled extensively and probably could have lived and conducted his research just about anywherePerhaps due to his tendency to be very focused and organized, or perhaps with a sense of loyalty to the opportunities made available to him, Shimek spent nearly his entire career in the State of Iowa, conducting research on and giving back to the land in which he and his family settled upon immigrating to the United States. , The State of Iowa honored him, posthumously, with the naming of the Shimek State Forest and Shimek Elementary School; fitting tributes to a scientist who was devoted to education, community, and the landscape in which he was raised, and sough to understand. Unidentified botanical specimen (grass). This photograph is included in the field notes of André Goeldi and part of a collection that includes 36 black-and-white photographs of specimens. André Goeldi was a Brazilian botanist who collected in Pará, Brazil, circa 1913-1920. SIA2012-3916. Mary Agnes Chase's Field Work in Brazil, Image No. 1847. Itatiaia. Donna Maria and Agnes Chase at summit. Photographs documenting Mary Agnes Chase's field work in Brazil, 1924-1925. SIA2009-4227. Steamer landing and rocky bluff on Yukon River, at Eagle, Alaska. Photograph taken by Mary Agnes Chase or A. S. Hitchcock, documenting field work. SIA2012-4544. A mountain gorge between La Paz, Bolivia and Illimani [Nevado Illimani]. Photograph was taken by A. S. Hitchcock during field work c.1923-1924. SIA2011-0570. The website includes creative writing inspired by photographs from Smithsonian field books. Since beginning the Field Book Project we have been actively creating blog posts, flickr sets, and other social media to share with people what wonderful and diverse information field books include. The materials we’ve shared through social media have been intended to shed light on the Project’s process and progress locating, identifying, and describing field books to enable researchers to use the biodiversity documentation that they contain. Over the last few months, it has come to my attention that the materials we’ve posted have inspired more than just natural history research. I shouldn’t really be surprised; documentation seems to cover just about every aspect of life. We’ve found poetry, artwork, cocktail and food recipes, in addition to the maps and detailed field work narratives one would expect. It seems that the idea of “field notes” extends well beyond natural history. Over the last two years I’ve found some surprising examples of this. If you search Google for “field notes” of “field work” you will find that many professions use the phrase at one time or other to denote documentation of practical experience. I’ve even found field notes from bartenders. If this term can relate to so many professions, I shouldn’t be surprised that field book content can be inspiring in equally diverse ways. One of my favorites is a website called Dr. Hurley’s Snake-Oil Cure that has a series of original stories inspired by photographs from field books (as we tend to think of them) that were posted on Flickr. A former intern from the Botany Department at National Museum of Natural History was inspired to create artwork based on Sir John Kirk’s field book from the Russell E. Train Africana collection housed at the Joseph F. Cullman 3rd Library in the National Museum of Natural History. Artwork by former intern (and now scientific illustrator) Eleonore Dixon-Roche, inspired by Sir John Kirk’s field book. We’ve used field books as inspiration for lesson plans distributed during the last two Smithsonian Teacher’s Nights. There’s amazing amount of rich material in field books, a lot of potential inspiration for natural history research and beyond. Has field book content inspired you? If so, we’d love to hear from you in the comments! An irrigation plant near Zacatecas, Mexico. Photograph taken by Mary Agnes Chase or A. S. Hitchcock, documenting field work. SIA2012-4605. This photograph is included in the field notes of André Goeldi and part of a collection that includes 36 black-and-white photographs of specimens. André Goeldi was a Brazilian botanist who collected in Pará, Brazil, circa 1913-1920. SIA2012-3917. Iceland Poppy, East Greenland, 1939. Photograph was taken during Bob Bartlett's expedition to Greenland, 1939. SIA2012-0658. Group photograph in field by A. S. Hitchcock, 1918. A. Johnston, Scientific Director of United Fruit Co.; Van Dine, Director of Laboratory, Tropical Plant Research Foundation; Earle, of Herradura, presumably while collecting in Cuba. SIA2011-0574. This photograph is included in the field notes of André Goeldi and part of a collection that includes 36 black-and-white photographs of specimens. André Goeldi was a Brazilian botanist who collected in Pará, Brazil, circa 1913-1920. SIA2012-3905. Man standing in a field with grasses and trees, possibly André Goeldi in Brazil. Circa 1913-1920. SIA2012-3935. Page from F. A. McClure's Diary Record, January 1, 1941. SIA Acc. T90028, Box 9. No negative number. Happy New Year from all of us here at the Field Book Project! As people who are constantly reading field notes, it’s hard for us to let a holiday pass without imagining what it was like for scientists who spent their holidays in the field, away from family, continuing to collect and study the specimens they so enjoyed. New Year’s Day, for many of us, is filled with promise—a new start, a new dream, new resolve to finish our projects, perfect our character flaws, strive to be better human beings. Even field scientists felt this way; they looked up from pressing plants, packing fish, and taking field notes, and resolved to better themselves. I started the day off rather badly, considering that it is ‘New Years,’ and that I still consider that I could and should do everything better than I do. As I look at this page, it seems that even my handwriting lacks character that statement however, cannot be true, for handwriting surely reveals character—or habit—to a certain extent, at least. Perhaps mine reveals my character more clearly as it is than it would if it were more regular. I believe, however, that the practice of a particular style of writing would have a beneficial effect… I must write more by hand. As for New Year’s resolutions, we read at the table at noon the list of twenty which I made out for myself at Nodoa, in Hainan, on the eve of the end of 1921. They still seem to cover the ground fairly well and so we let them stand. In short our resolution is ‘To make the most of life’. Here we are, over 90 years later, and McClure’s resolution to “make the most of life” still sounds like a good one. We’ll toast to that one. Happy 2013 everyone! Floyd Alonzo McClure conducting field work, possibly in China, circa 1919-1950. SIA Acc. T90028. Box 7 Folder 15. No negative number. We get to know some interesting characters by reading field notes. Floyd Alonzo McClure (1897-1970) was one of these characters that I had the pleasure of learning about while cataloging SIA collection T90028. McClure was a bamboo guy. (We really get familiar with these collectors, don’t we?) To put it another way, he studied Bambusoideae, a large group of genera in the grass family (Poaceae), for the majority of his career. His major work was the publication “The Bamboos, a Fresh Perspective,” which was published in 1966. McClure’s connection to the Smithsonian began in 1940s, when he joined the National Museum of Natural History as an Honorary Research Associate. But let’s start a little earlier. McClure was born in 1897 in Shelby County, Ohio. He attended Ohio State University where he earned a BS in Agriculture in 1919. That year, McClure took a position in China teaching Economic Botany at Canton Christian College (later Lingnan University), a move that would define much of his life and career and lead him to spend 24 years in that country. McClure found a lot to learn about in China beyond just bamboo. He studied Chinese language and culture. He was interested in the land, the people, and the local customs. As a botanist, these interests served him well. Navigating the country, speaking with farmers, and learning local uses for bamboo plants certainly must have informed his career in economic botany. McClure’s diary from Hainan, China, 1921. SIA Acc. T90028. Box 8 Folder 24. No negative number. McClure lived in Canton, China and went on collecting expeditions throughout Hainan province in 1921, 1922, 1929, and 1932. He collected bamboo specimens mainly, but occasionally other grasses, orchids, and other higher plants. He wrote about his daily experiences and observations in his diaries. While reading through, I found his reflections on the people and cultures he observed respectful and thoughtful. He made “tentative” observations, and allowed for differences in perspective and opinion. McClure was a humble man. His field notes made it very clear that even though he was a teacher, he enjoyed learning from others around him. The Japanese invasion of China in 1941 forced McClure to return to the United States where he would spend the rest of his life. It’s easy to get lost in McClure’s diaries. They speak of his day-to-day life, a blend of family and botanizing. Amidst teaching and conducting botanical work in the lab, McClure went on bicycle rides with his wife Ruth, and spent a great deal of time with his two young daughters, Sophie Louise and Janet (or “Bunny”). His entries depict a loving and dedicated husband and father. McClure’s family did, indeed, seem to become enmeshed in his professional life. The first and strongest example is the fact that McClure brought his new wife to Canton where they spent the first decades of married life together and raised two children. When McClure took trips, his wife and children sometimes came along. In 1959, Ruth became his research assistant, working with him daily until he passed away. McClure with his wife Ruth and daughters, circa 1937. SIA Acc. T90028. Box 7 Folder 15. No negative number. McClure saw the connections between studying plants and thinking about how they can contribute to a society, reinforce culture, and even take a role during war times. In 1943 McClure was recruited for his knowledge of bamboo by the U.S. military. If that sentence sounds odd to you, you are not alone—I also was surprised to learn this! During World War II, the National Defense Research Committee was looking for someone with a deep knowledge of bamboo to research options for making ski poles for troops in extreme northern climates. At the time, wood was expensive and increasingly in demand. Bamboo was practical and fairly cheap. McClure was their man. McClure traveled to Central American locations to research and conduct experiments on bamboo species that could be used to make ski poles. I haven’t found a great deal of information on the result of these efforts, but I certainly hope that U.S. troops benefited from McClure’s knowledge of safe, sturdy bamboo species. Often, interesting tidbits like this one are wrapped up in the field notes. It’s what makes field notes so unique; they are rarely cut and dry, and more often than not, include all sorts of information beyond just lists of specimens collected. McClure’s diaries can give us a wealth of information on culture, wartime activities, family life, and the man behind the books. Meyer, F. G. (1972). Floyd Alonzo McClure (1897–1970) — A Tribute. Economic Botany, 26(1), 1-12. Walker, E. H. & Archer, W. A. (1971). Floyd Alonzo McClure (1897-1970). Taxon , 20(5/6), 777-784. Image from P. A. Glick’s publication Collecting Insects by Airplane in Southern Texas in 1957. Image is Public Domain from Google eBooks. Aviation has had significant effects on the nature of field work. It has changed not only how the collectors get to a site, but also how they see and collected, resulting in wide-ranging consequences. By the mid-twentieth century, commercial aviation was dramatically changing the speed of travel; collectors, up to that time, would commonly travel long distances via train or boat. With commercial aviation, a weeklong boat trip to Africa became a multi-hour long flight. During the 1960’s when commercial air travel became more widespread, there was an influx of major surveys by Smithsonian departments involving large numbers of staff that would have proven far more logistically complicated prior to commercial aviation. The speed and ease of commercial air travel meant collectors could spend significantly less time getting to their sites and more time on-site. With the time they saved, collectors could spend longer at one location or visit additional ones. The advent of planes also affected collecting by changing collectors’ perspectives. Collectors could see the environments they studied from an entirely new vantage, hundreds or thousands of feet in the air. Some scientists even took it a step further and used aviation as a way to collect the specimens. Perry A. Glick, an entomologist with the US Department of Agriculture’s Agricultural Research Service, used nets that attached to planes, enabling insect collecting in air to study the altitudinal distribution of insects. He produced several publications about this during the 1950’s and 1960’s. By the 1940’s, there are examples of scientists attempting to integrate the aviation into their field work observations and collecting. Some of these attempts proved less than successful, while others helped demonstrate aviation’s value to field work. I found a reference to an unsuccessful attempt with a helicopter in a journal of C. O. Handley, Jr. Judging from the results, I am assuming they did not try it again. [Thule, Greenland, 1948] The way it turned out he flew in the helicopter instead and spent the afternoon trying to fish from that. On the water, with its rotors off, the plane blows about like a kite even in a small breeze. Thus no matter where they would land, they would soon drift in to the beach. Another disadvantage was that when the helicopter starts on the water after its rotor has been dead, the whole thing spins with the rotor until the latter attains sufficient speed to stabilize the plane. Though the helicopter proved less than useful over water, it yielded results over land. The journal includes hand drawn maps that indicate that survey results were successful, as seen in recorded observation taken via helicopter and on foot. Example of F. Raymond Fosberg’s observations from an airplane. Photographed by Emily Hunter. A more successful example of aerial observations is the work of F. Raymond Fosberg, (discussed in the February 24, 2012 article by Emily Hunter), who recognized the benefits of aerial observations alongside ground observations for his field of botany. Several of his field books include extended aerial observations of sites where he collected botanical specimens. Fosberg even published articles promoting the use of aerial photographs for surveying and studying botanical distribution. He proposed using military aerial photographs (that were taken during World War II) for this purpose. I have not been able to determine whether his hopes for these photographs came to fruition, but there are now a considerable number of examples of aerial photography being used for this type of botanical study. Botany was not the only other field to make use of aviation. Harry S. Ladd used aerial observations in his field of paleontology and geology. Field notes document his observations via helicopter, noting the shape and character of reefs in Fiji, as seen below in a journal excerpt. May 7, 1968 Tues - By Hill helicopter from Heron Id to Gladstone [Fiji]. Flying over reefs confirms impressions obtained on ground – i.e. if lee reefs and lagoons. Reefs appear to be more saw-toothed on lee than on windward. No suggestion of lithothamnion(?) ridge to windward – only what looks like a low marinol bulge (of debris?). Lagoon of Wistari(?) appears to have small ring-like structure-comparable to that seen yesterday in Heron lagoon plus irregular. Since the 1960’s, the use of aviation and aerial photographs has spun off in a myriad of directions. Aircraft and aerial photographs are now used for monitoring and management wildlife habitat, locating and analyzing archaeological sites, and studying plant ecology. Scientists and even the National Park Service are beginning to utilize unmanned aerial vehicles. All of the forms of transportation discussed in our transportation series have helped shape the research recorded by the field notes we document. Sometimes they present challenges to the collectors, sometimes a new advantage or perspective. For me, it demonstrates the flexibility and ingenuity of our collectors to see and to use opportunities as they present themselves. Field work often seems to be journey of the unexpected; I can’t wait to see what comes next. Even having studied history in college, it is difficult to chase away the ennui of seemingly dead-end research, particularly when you imagine divulging exciting facts and uncovering lost secrets. For me, research possesses the allure of sleuthing a mystery. Spontaneous discoveries do not exist outside the realm of possibility, but more often than not, making difficult sources pliant requires context and focus. My experience with the Smithsonian Field Book Project exemplifies this process of making your search an informed one. When told I could write about almost anything pertaining to the field books, my question was, “Where to start?”! Eager as I was, I was at a bit of a loss. Annotation from Chase field notebook #3, "Who is Ramon Corral?" SIA Acc. 11-093, National Museum of Natural History, Department of Botany. Photograph by Emmie Miller. Then I found an ink-etched scrawl in a seam between pages of Agnes Chase’s field book: “Who is Ramón Corral?” This was my spontaneous discovery! Never having heard the name, I asked the same question. Who was Ramón Corral? A quick search explained that Corral was vice president of Mexico from 1904-1911. Corral resigned from his post as incumbent president in light of revolutionary uprisings against the government of Porfirio Diaz. Diaz and Corral’s deposition began the Mexican Revolution that made Pancho Villa and Emilio Zapata famous rebel leaders. This gave me context to understand one small mystery buried in Chase’s scientific notes. Uncovering Corral’s identity also supplied me with the focus for this blog post. While Chase’s quick scrawl may have been a passing thought that was never answered, her presence in Mexico at this time subjected her to precarious situation, including growing revolutionary sentiments. Her exposure to this tension may have prompted her thought on Corral’s identity. Unfortunately, however, there was no other obvious record of conflict in her notes. Full page spread of Chase field notebook; note the comment on Corral on the left page. SIA Acc. 11-093, National Museum of Natural History, Department of Botany. Photograph by Emmie Miller. So began my hunt for other botanists with similar experiences represented in the field books. Some botanists used wartime as an opportunity for collecting, like Edward Palmer. As a Union soldier during the Civil War, his command sent him west to Colorado, a new biological landscape for him to explore; his field notes document his collecting during this time. Another botanist, Egbert Walker, received specimens mailed from American servicemen all around the globe during World War II after establishing the Servicemen’s Collecting Program, giving him access to diverse ecosystems. But the most intriguing botanical character to pursue life-threatening field work was Joseph Rock. Rock was perhaps more an adventurer than a botanist. He spent his life collecting in Asia and studying Chinese and Tibetan indigenous cultures. Rock’s frequent use of Chinese characters in his field books demonstrates the degree to which Rock studied Chinese culture. He journaled his ambivalent feelings about China, criticizing the culture from his very Western perspective, though he often felt at home there. Context is pivotal here in explaining Rock’s experiences: Rock continually returned to China despite the five occasions on which violence interrupted or destroyed his work. This makes his field books more valuable, as Rock had, at times, poor luck preserving his scholarship. To understand the risk of his returns, you must understand Rock’s departures. Sample page from Rock's field notes with visible Chinese characters amid his specimen descriptions. SIA Acc. 11-094, National Museum of Natural History, Department of Botany. Photo by Emmie Miller. Message from Joseph Rock to William Maxon, sent from Yunnan, China (1922). SIA Acc. 11-094, National Museum of Natural History, Department of Botany. Photo by Emmie Miller. One of Rock’s 1922 field books gives a cursory glance at the difficulties of working in China. In a note to Smithsonian botanist William Maxon, he says, “I will mail [my field book] to you from China if I find a post office in Yunnan.” At what point he found a post office is hard to say, but presumably the note and the field book were sent together, reaching the Smithsonian safely. Rock’s early years in China are well-documented, and while he botanized, he experienced localized tribal conflict. In one instance he’d made preparations for the precipitous journey to a mountain pass for collecting, but fighting between Chinese Muslims and Tibetan Buddhists jeopardized the expedition and it was called off. World War II further challenged Rock’s studies. When the Japanese invaded China in 1937, Rock fled to modern-day Vietnam. 1944 found Rock evacuated to the United States as WWII intensified in the Pacific. In 1949, Rock fled China for the last time during the Chinese Revolution. The context surrounding Rocks’ exploits explains why my article’s focus is important: scientists often find themselves in dangerous regions in dangerous times. Rock’s location in the early twentieth century posed challenges due to the dangers and inconveniences of the politically unstable region. Like the other determined and ambitious botanists mentioned in this article, Rock would not be stopped. Beaty, Janice. Plants in a Pack: A Life of Edward Palmer, Adventurous Botanist and Collector. New York: Pantheon Books, 1964. Chase, Mary Agnes. Field Notes, Natural History Library (1906-1959). Jowett, Philip S. The Mexican Revolution, 1910-20. Oxford: Osprey Printing, Limited, 2006. Palmer, Edward. Field Notes, Natural History Library (1861-1914). Rock, Joseph F. Field Notes. Natural History Library (1920-1924). Smithsonian Institution Archives. SIA RU007270, Walker, Egbert H (Egbert Hamilton) 1899-1991, Egbert Hamilton Walker Papers, 1923-1987. Finding Aid. Smithsonian Institution Archives. 21 September 2012. http://siarchives.si.edu/collections/siris_arc_217427?back=%2Fsearch%2Fsia_search_findingaids%2Fegbert%2520walker. 11 July 2011. Sutton, Stephanne Barry. In China’s Border Provinces: The Turbulent Career of Joseph Rock, Botanist-Explorer. New York: Hastings House, 1974. Recipe for a pesticide containing kerosene, water, and condensed milk. This page was in between the entries dated October 21 and 22, 1881. Smithsonian Institution Archives, RU007107, box 1, folder 10. SIA2012-2212. 4) evaluate (slight improvement; add more cheese? subtract lighter ingredients? use denser cheese?). I usually associate the scientific method with lab (or kitchen) work, but science experiments can and often do also occur in the field. When they do, the notes from those experiments are field notes—see where this is going? Over a year ago, I cataloged field notes by Henry Guernsey Hubbard, horticulturist, botanist, and entomologist for the U.S. Geological Survey (Smithsonian Institution Archives RU7107). Perhaps Hubbard’s blend of professional knowledge specially equipped him to perform his series of field experiments in the 1880s to develop a pesticide for parasitic insects damaging orange trees. He tested several pesticides, emulsions concocted from varying amounts of kerosene and condensed milk. The recipes, included in his field notes, are accompanied by observations on the effectiveness of each emulsion. Observations of orange trees infested with lepidoptera larvae, spiders, and scales, September 27, 1881. Smithsonian Institution Archives, RU007107, box 1, folder 10. SIA2012-2210. Examination of orange trees infested with scales and other insect pests and results of experiment no. 10, October 21, 1881. Smithsonian Institution Archives, RU007107, box 1, folder 10. SIA2012-2211. Results of experiment from emulsion no. 3, November 17, 1881. Smithsonian Institution Archives, RU007107, box 1, folder 10. SIA2012-2214. Hubbard’s recipes spoke to me. The thought of Hubbard mixing up a strange concoction of kerosene and condensed milk, like some mystical apothecary, made me want to test his pesticide recipes. Beyond the childish desire to mix up odd potions, I was curious to know how effective his solution would be on pests I’ve encountered. Boil 1 jalapeño, sliced and retaining seeds, with 2-4 cups of water for 20 minutes or more. The water boiled down to a spicy 8oz, which I poured into a spray bottle. I bought two basil plants, drenching the leaves of one plant with my new pesticide and leaving the other unsprayed. Both were planted. Basil plant without pesticide before experiment, Summer 2012. By Sonoe Nakasone with Ipod camera. Basil plant with pesticide before experiment, Summer 2012. By Sonoe Nakasone with Ipod camera. Unfortunately for me and for my readers, I didn’t do a great job at two key elements of the scientific process: the experiment and the evaluation. I was inconsistent about spraying the test plant each day and inconsistent in observing and note taking. I did, however, take before and after pictures. Although these grainy photos show very little, I hope you’re able to see that the recipe seemed successful. The plant with the pesticide received less damage than the one without. My evaluation and conclusion: this stuff works, but would probably produce better results if implemented more consistently. Basil plant without pesticide after experiment, Summer 2012. By Sonoe Nakasone with Ipod camera. Basil plant with pesticide after experiment, Summer 2012. By Sonoe Nakasone with Ipod camera. Hubbard’s field notes are an excellent example of scientific experimentation. The ingredients in Hubbard’s recipes sparked my imagination as readily as the witches’ potion in Macbeth and ignited my desire to conduct my own field experiment. So, from Hubbard to me, from me to you: try a field experiment, and see how you do. And as always, please share your experiences with us. When I travel to a new place, I often keep a journal. Although my journals are self-indulgent—how I feel, what I think, what something means to me (yawn)—I can’t help but fall into a pattern of recording, by text or image, the subjects I find most compelling. Street signs, billboards, food carts, rusted out gas stations and convenience stores, dusty streets, and people, strange and interesting people, fill my camera and notebooks. I usually end up tossing out half of it a year later. But old habits die hard. The next trip, there I go again: the same rust, the same dust, the same neon signs, the same crooked smiles and haggard eyes. That’s why I’m not surprised about Killip. Elsworth P. Killip (1890-1968), Head Curator of the U.S. National Herbarium from 1946 to 1950 and expert on South American phanerogams, kept a travelogue of a fun filled canoe trip down the Adirondack rivers. This travelogue is available for reference within the Smithsonian Institution Archives collection, Ellsworth Paine Killip Papers, 1914-1950. Like me, Killip couldn’t resist his habits, turning the travelogue of his vacation into part field book of observation and documentation. Although I didn’t find any evidence in the travelogue that Killip collected anything during his canoe trip, his record of the flora in the Adirondack Mountains in the summer of 1914 provides a portal through which modern researchers can observe perhaps a bygone habitat. ﻿“M. R. W. [Milton E. Woodams] on the Summit of Marcy” and “E. P. K. [Killip] on the Summit of Marcy,” 1914. Page 62. RU7375, image SIA2012-8804, Smithsonian Institution Archives. “Mountain Pond” and “Cooking at Mountain Pond,” 1914. Page 20. RU7375, image SIA2012-8761, Smithsonian Institution Archives. It’s rather clear throughout the travelogue that Killip is on vacation. The titles (“An Account of My Canoe Trip through the Adirondacks: My First Travelogue” or “Camping in the Adirondacks”), the entries on the trials and triumphs of canoeing, and the goofy pictures of Killip staring strangely into the camera, all illustrate this well. Soon after the first few pages, however, Killip begins switching back and forth between my-summer-vacation entries and scientific recording. Killip logged the various plants he observed and included general descriptions of the flora in localities he visited. When I found photos of plants with identifications, I knew his habits had taken hold. Killip was turning his vacation into a field trip, as we have seen with so many of these darn scientists. Even in an unsuspecting image of “Mountain Pond,” the subject seems suspiciously (and purposefully) obscured by the foliage on the edge of the pond. I don’t think there is much skepticism among our readers that such observations can be extremely useful, especially when coupled with dates and accurate locality information (but I’m still going to talk about it). Because Killip’s journal is foremost a travelogue, every location he visits is well documented. At the end of his journal, Killip even includes an itinerary of travel. That’s right Killip; go crazy and record every single plant you see if you want to. Each observation of plant life you form, Killip, is clearly associated with a date and locality. Thank goodness. Map of Cold River and Raquette River intersection, 1914. Page 73. RU7375, image SIA2012-8818, Smithsonian Institution Archives. Map of Cold River and Raquette River intersection, 1914. Page 73. RU7375, image SIA2012-8818, Smithsonian Institution Archives. If after reading Killip’s travelogue there is any doubt that Killip’s hobby, habit, obsession—whatever you want to call it—became a large part of his trip, one need only look at the three page list of plants observed that is included in a sort of appendix. For Killip and many other scientists at the Smithsonian (dead and living), this habit of field booking seems more like a compulsion because it shows up during times you’d expect these people to just RELAX. Knowing this, however, a scientist’s personal travelogues or diaries should not be immediately discounted from containing useful scientific information. When the record of a scientist’s travels are available, it might be worth taking a few minutes to see if they couldn’t help but record some field observations. Along with finding a unique personal narrative, you may be unlocking untapped biodiversity information. The Smithsonian Center for Conservation summer intern Janelle Batkin blogs about her work Putting It All Together: The Assembly and Rehousing of Glass Plate Negatives. Read it on The Bigger Picture. Authors: Funk, Vicki A. Tuccinardi, C.
D. Griffiths field notes, Texas and Mexico, 1905. SIA Acc. 11-106. Photo by Emily Hunter. While cataloging the field notes of David Griffiths (1867-1935) I was intrigued to find interesting markings in one book. The book includes Griffiths’s field notes from Texas and Mexico, 1905. It looked as if something wet was stamped on the paper and then outlined in pencil. Upon further investigation, I excitedly formed a theory that remains unproven. During the time this book was created, Griffiths worked for the USDA, where he studied grasses as well as cacti of the United States southwestern region and northern Mexico. The Department of Botany, National Museum of Natural History, has ten of Griffiths’s field books. An image that possibly shows the stamped cross-section of a flower and fruit. 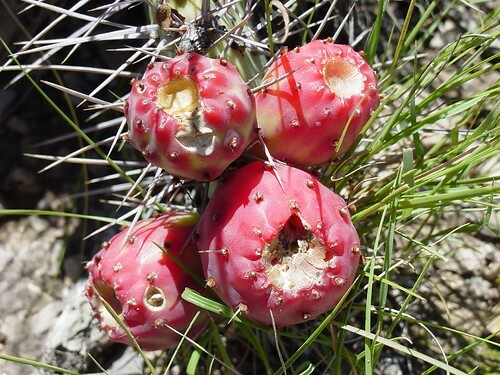 Reading through the 1905 field book, I saw that Griffiths was collecting Opuntia species, focusing especially on fruit. Griffiths’s entries included detailed physical observations of cacti specimens (fruit color, flower color, size, shape, etc.) and notes on the use of fruits as food. Locally, the fruits are called “tuna” and Griffiths includes notes on how Mexicans cut and eat them. The paper is stained darker, forming a particular shape. That shape was outlined in pencil. Some of these images have a light-colored powder on them. Some of the shapes have a small check mark. Stamp in book showing white powdery surface, possibly mold. D. Griffiths field notes, Texas and Mexico, 1905. SIA Acc. 11-106. Photo by Emily Hunter. My hypothesis is this: Griffiths cut the fruit lengthwise and pressed the cross section against the paper to record the shape and size of the fruit. He then traced an outline, possibly to indicate the peel or skin of the fruit, and the knobby appearance of the outsides of it. The light-colored powder may be mold from the juices. I asked Rusty Russell, Collections Manager in the National Museum of Natural History Department of Botany, what insights he could offer. He hadn’t seen anything similar recorded in field books before, but thought that my “cactus fruit stamp” hypothesis sounded plausible. I’m still unsure what the check mark means. I hoped that it meant that the specimen was collected, since collector numbers seem to be included with most entries. Unfortunately, I couldn’t find a match between specimens recorded in the field book and the collections in the U.S. National Herbarium, so all of this is still just an educated guess. I’d love to hear if anyone else has come across this kind of field note recording. I would also be very interested to know if anyone does something similar in their own field notes! Please feel free to comment below. Sketch showing behavioral observations of bird, from the field notes of Martin H. Moynihan , 1961. SIA Acc. 01-096. Image: SIA 2012-1914. While cataloging field books I often come across rough sketches. The sketches usually depict specimens, and are completed quickly and roughly in the field. I love finding sketches. Besides being nice to look at, they illustrate scientific names and collector numbers. For me, they are pretty pictures, but I wondered about the reasons that collectors might make drawings in the field, and what the sketches can tell us. I met up with Botany Collections Manager and Field Book Project Co-PI Rusty Russell to ask him for a botanist’s perspective on the value of field sketches. Rusty reminded me that to draw something is to really see it. I understood immediately. Before attending library school, I studied art. That single remark spoke directly to my experience drawing from life. To sketch something—to take in all of the lines and planes, colors, shades, textures, and nuances and put them on paper—is to really understand the physical form. Whether it’s a person, a shell, a plant, an insect, or an animal, you have to take time to observe it from all angles. The very act of rendering an object can fix it into your memory. How art and science intersect yet again! A page with sketches from the field notes of Martin H. Moynihan, 1961. SIA Acc. 01-096. Image: SIA 2012-1899. Illustration of a fish collected during the United States Exploring Expedition, 1838-1842. SIA RU7186. Image: SIA2011-1233. Jenny Keller actually made this same point in her chapter “Why Sketch” in Michael Canfield’s book Field Notes on Science and Nature. Keller asserts that sketching can assist a field biologist with observing and documenting aspects of a specimen that may otherwise go unnoticed or unrecorded. She points out that photography can sometimes miss certain aspects of a specimen: it can only shoot one side at a time and often the color can come out wrong. Keller writes that sketching can ensure that you see and record all observations while you’re still in front of the subject. I brought some of the field books of botanist T. R. Soderstrom to Rusty’s office so that we could take a look at the sketches together. I was curious why Soderstrom made sketches and measurements of bamboo in the field if he was collecting the specimen anyway. Would a sketch be necessary? Wouldn’t it be easier to take measurements and provide observations back in the comfort of the lab? Sketches of bamboo from the field book of T. R. Stoderstrom, Laos, 1974. SIA Acc. 12-404. Photo by the Field Book Project. Rusty explained that a sketch is “a way of collecting data visually that might not be available to you once the collection is made”. In the case of Soderstrom’s sketches, he was recording measurements of internodes (distances between nodes of bamboo) that he wouldn’t be able to take back in the lab. Because the bamboo specimens that Soderstrom was collecting were so large, only portions were collected. Soderstsrom may have wanted to get measurements for the entire specimen, and that was only possible in the field. The sketches are an obvious way to visualize, remember, and understand the data. So, these are just a few ways that field book sketches are valuable documentation. Keller includes even more reasons for sketching in the field, and I encourage you to read her chapter in Field Notes on Science and Nature. To all collectors: sketch on! Sketches by unknown creator, undated. SIA Acc. 12-402. Photo by the Field Book Project. Canfield, M. (2011). Field notes from science and nature. (1st ed.). Boston, MA: Harvard University Press. The Field Book Project and YES! ﻿Smithsonian YES! (Youth Engagement through Science) delve into field notes of Smithsonian Botanists from the late 19th / early 20th century. Photo by Field Book Project. Tuesday, the Field Book Project welcomed 25 students from the Smithsonian YES! (Youth Engagement through Science) summer program into the National Museum of Natural History Main Library stacks to view field books from the Department of Botany. Students explored nine original field books created between 1897 and 1946, each field book highlighting different aspects of note taking. During their internships, YES students will create their own field notes while working with Smithsonian scientists. Forensic Anthropology Lab Educator Nicole Webster was charged with developing the students’ field book curriculum and the yellow notebooks seen in the photo above. Webster has agreed to blog for the Field Book Project at the end of the summer, so please check back for more about field notes from the YES! students. 24. Calytrocarya [sic]. Photograph by André Goeldi, circa 1913-1920. SIA Acc. 12-045, Image SIA 2012-3890. In January, I began cataloging field books in the Department of Botany. In my first week, I came across a box of materials related to the botanist André Goeldi. These materials had a note from our conservator that read “Extremely brittle!” Carefully, I opened the folder and gasped as I saw the contents--black and white photographs of botanical specimens, mostly grasses. Each one was stunning. The photographs themselves were “silvering” (also called silver mirroring)--something that happens to older black and white gelatin prints, in which the silver particles begin to oxidize, producing a blue-ish metallic look. Although a conservation problem, the silver mirroring gave the images an otherworldly glow. The photographs depicted specimens, set upon a black background, with a tape measure in many of the images to indicate scale. The photographs were clearly taken to document Goeldi’s specimen collection, but it’s hard to deny their aesthetic merit as well. Grass is something usually taken for granted as common, but seeing the variety of grasses depicted in these 36 photographs made me think twice about the familiar plant family. Isolated clumps shown on the dark background gave focus to the form, while highlighting the elegance (and the occasionally tangled chaos) of some of these plants. Man standing in a field with grasses and trees, possibly André Goeldi in Brazil, circa 1913-1920. SIA Acc. 12-045, Image: SIA 2012-3935. I examined the contents of the folder for clues about the materials and their creator. A letter included with the photographs indicated that the images were sent to Albert Spear Hitchcock in 1920. Hitchcock was an expert on grasses, and presumably he and Goeldi corresponded regarding the identification or perhaps the exchange of the specimens. Also included with the photographs were specimen lists, with entries in Portuguese. These lists, handwritten on an extremely acidic paper, were even more brittle than the photographs. Some of the information had even crumbled away from the edges. After consulting with our conservator, I digitized the entire contents of the Goeldi box. This way, the information is captured digitally in case the physical objects wear down and lose additional information. From these images, I selected several of the most interesting to make up the flickr set. List of grasses sent with photographs by André Goeldi to A. S. Hitchcock in 1920. SIA Acc. 12-045. I was interested to find out who André Goeldi was. My initial research returned few results. I knew that André Goeldi was working in Pará, Brazil circa 1913 to 1920, and that he was not the same person as Emílio A. Goeldi, first director of the Museu Paraense Emílio Goeldi. I dug into the archives and also reached out to the Museu Goeldi to see if they had additional information. To my delight, Dr. Nelson Sanjad, researcher, History of Science at the Museu Paraense Emílio Goeldi, responded to my email and offered additional details on Goeldi’s life. Dr. Sanjad helped to fill in many of the gaps, informing me that Goeldi (name variation Andréas Goeldi) was born in Switzerland in 1872 and immigrated to Brazil in 1893. He worked at the Museu Paraense Emílio Goeldi from 1901 to 1906 and then at the experimental farm Estação Agrícola de Peixe Boi. Dr. Sanjad also informed me that Emílio and André were cousins. The correspondence with A. S. Hitchcock dated 1920 may be the last documented mention of André Goeldi’s activities, so perhaps he died shortly after. This set of field documentation serves as an example of how materials from all over the world end up in the care of the Smithsonian Institution. Curating this set of images sparked an interesting journey for me, and required the collaboration of colleagues across various fields at home at the Smithsonian as well as abroad. The collaborative and interdisciplinary nature of the Field Book Project was something that initially attracted me to apply as an intern over a year ago. I hope that you enjoy learning about the process of bringing these images to the public sphere, and I encourage you to share any comments or additional information on the man behind these photographs. Thank you very much to the following people for their assistance with various aspects of this project: Dr. Nelson Sanjad, Museu Paraense Emílio Goeldi, Pará, Brazil; Anna Friedman and the conservation staff at Smithsonian Institution Archives; Tad Bennicoff and reference team at Smithsonian Institution Archives; Kira Cherrix and the digitization staff at Smithsonian Institution Archives; and all of my colleagues at the Field Book Project. Last summer, Field Book Project staff and interns began to catalog the hundreds of field books that are in the care of the Department of Botany. This summer, the Field Book Project has reached a significant milestone. As of this writing, the final collection of Botany field books is being cataloged -- at least for now. “At least for now” because while the current cache of Botany field books has been documented they, like all of the collections at the National Museum of Natural History, grow and diversify. Field books are still being “found”, and some day current staff will contribute their own field books. For now, the Field Book Project only catalogs the field notes of inactive collectors. The numbers are far greater than the original estimates. To date the Field Book Project has cataloged 1,018 botanical field books created by 168 field biologists. Many of these field books have received special conservation attention from experts at the SI Archives, and now exist in a more controlled environment. We’ve created consistent records and access points that ultimately make the field books and their content more accessible to researchers. The short version? You will have an easier time finding and using these field books. In 1980 former Botany Librarian Ruth Schallert prepared an inventory of field books being stored in the Botany Library. For more than two decades, this listing was the only electronically available field book resource on the NMNH website. In the course of cataloging, however, we have found that some of the field books were missing. Their current storage in the Natural History Library improves our ability to maintain and preserve the Botany field books. The task of digitally scanning field books has begun, and soon researchers will be able to locate field book items through the catalog by several access points (dates, creator, locality, and others) and be able to see and read the individual field book pages. Field books are the original source of information for collecting activities and the resulting collections. They are, therefore, even more important than specimen labels. The impact of reaching this milestone in Botany is significant in terms of improved access to this critical data, all of which bodes well for research and collections programs in the Department. Postcard of the United States National Museum Building, now the Arts & Industries Building, c. 1915. Smithsonian Institution Archives, Record Unit 95, 2003-19543. Summer has announced its presence in the District of Columbia. I know this because the tourists have amassed to summer vacation numbers at the entrances of the museums along the National Mall. As the exhibit halls fill with visitors, the back halls of Natural History begin to empty. For many natural history disciplines, summer is a prime time to head in to the field and collect. In my short time at the Smithsonian I have enjoyed hearing about the many far flung places researchers have traveled during this time of year. In my experience, it seems that many scientists stay closer to home to collect during the summer, and as Smithsonian scientists often lived in and near the District of Columbia, we’ve cataloged a number of field books documenting DC field work. One of my favorite characteristics of these books has been the specificity of location identification. They frequently indicate not only DC neighborhood but also nearby landmarks (i.e. corner of US Department of Agriculture building). While passing families peruse maps to determine their next destination on the Mall, I have begun to wonder how many of our popular attractions are documented in the field books. Hopefully my list below will spark some new ways of looking at these familiar locations. These are just some of the locations I found in the 110 field books we have cataloged relating to the District of Columbia. For some disciplines, like botany, documentation of DC biodiversity is well established. In fact the Department of Botany at NMNH offers online access to database plant specimens of the Washington DC / Baltimore area. 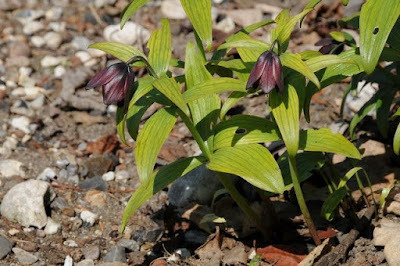 The website also offers maps of what’s currently in bloom. Whether you are resident heading on your daily commute or a visitor to our fair city, I hope this inspires a new way to look at your surroundings. Incense Sticks of Bamboo. A. S. Hitchcock. 1921. SIA2011-0561. Near view of native vegetation on sand-steppe near Heidesheim, Germany, taken by Bohumil Shimek, 1914. Photograph documents geological and botanical observations. The children are not identified. SIA2012-3229. Anyone reading my blog posts has probably noticed I tend to include more photographs from the field books than images of text. I choose photographs because they often have more visual impact when I give an overview of a collection’s contents. Blogs are so short that I rely on the ability of a photograph to inspire an emotional reaction from the reader. Photographs commonly straddle the line between the personal and profession side of the scientist. Usually the majority of detailed scientific content comes from the text, and photographs augment. To this end, I try to catalog the images in a collection last, so that I will have in mind locations and circumstances the photographer is documenting. In the case of Bohumil Shimek, I wish I had done the images first. Shimek is an anomaly for me in several ways. He did not work at the Smithsonian; his specimens and field books came to the Institution after his demise. Also, Shimek recorded everything in his field books. Most scientists I’ve cataloged limited details to scientific documentation and personal observations, since field books were usually being sent back to the departments of Natural History. They would not usually include information about other pursuits. Shimek includes details about his other interests and other jobs in midst of his field work documentation. This meant finding notes about repairs for area elementary schools, land survey notes, and details about meetings relating to immigration rights, between details of observed geological formations and related vegetation. Given Shimek’s background in geology, zoology, and botany, his field notes make for fascinating snapshots of biodiversity, but they scattered among a lot of information that is not within the parameters of the Field Book Project. Q macrocarpa var. depressa. Prairie border. S.W. corner of Lyon county, Iowa. SIA2012-3228. His personal and professional focuses became a bit muddled for me. Ironically, his photographs are the most consistently, scientifically focused part of his collection. Most of his photographs are in one of four boxes, in groupings of eight, most with a description of the location, vegetation, and geology. I can’t begin to tell you how clear his work became when I started cataloging these! Wind gauge and unidentified field equipment on hillside. SIA2012-3232. There is another reason I love these photographs so much. I grew up where Shimek did much of his field work. During my childhood, my family routinely drove 8 to 12 hours through the Midwest. I spent lot of time staring out the window of the car, looking at the landscape between Iowa and Missouri. My main focus was trying to determine how close we were to our destination, and save my mother from another “are we there yet.” I watched for any variation, including the groves of trees that dot the landscape foretelling of farm complexes, wind breaks, or rivers and creeks, as well as formations like the bluffs along the Missouri river or exposed limestone along the interstate heading to Kansas City. I never really had a good notion of why these changes occurred. Lo and behold many years later, working at the Smithsonian, I cataloged a scientist that studied and documented these very topics. And, in the course of it, I learned the geography of my childhood. Cover of Edward Palmer's field book from Durango, Mexico, 1906, Edward Palmer field notes from the Department of Botany, SIA Acc. 12-346. As a field book cataloger, there are two types of field materials that I tend to come across the most: specimen lists and narrative field notes. Specimen lists are just that—lists of specimens collected in the field. I’m currently working on cataloging field books from the Department of Botany, so these include lists of plants collected in the field, usually with collector numbers (numbers assigned in the field by the collector) as well as name (scientific, if known at the time, or common if the specimen is to be identified later). Other information may be included as well, including the habitat the plant was found in, locality, date of collection, altitude, etc. Specimen lists are informative--they are the original source materials for catalog records of specimens. Narrative field notes, however, are my favorite to catalog. They tend to be descriptive, allowing botany novices (such as myself) to get a visual picture of the collecting trip conditions, the route taken, the landscape and location, and the plants collected. Sometimes they read like diaries or journal entries; they describe daily activities and include reflections, thoughts, and opinions. I’ve found some collectors possess a real power of description. It seems to me, there is an art of using the English language to paint a visual picture and convey information to others or even to oneself (to remember at a later date). As an undergraduate studying art history, the skill of written description was invaluable for relating the look and feel of a work of art. But this skill translates to the sciences as well. As we mentioned in a recent blog post on John Muir, detailed habitat descriptions can be invaluable for conservation efforts such as habitat reconstruction. Two entries in Edward Palmer's field book from Durango, Mexico, 1906, Edward Palmer field notes from the Department of Botany, SIA Acc. 12-346. Can you picture it? It’s a brief entry, but Palmer hits on size, color, shape, maturity. He even throws in a mention of the plant’s superlative beauty. With a little help from the Smithsonian’s NMNH Department of Botany staff, I was able to read the determination written on the entry as Solandra guttata. I also found an image of the living plant, to compare to Palmer’s description. Check out the picture below! Pretty good, huh? I think my old Art History professor would be proud. For more on Edward Palmer, check out this site hosted by the National Museum of Natural History Department of Botany, and Smithsonian Institution Archives Record Unit 7442.
Who was Mrs. William Owen? I recently cataloged a small field book by a “Mrs. William Owen”. I found this book unusual (and very interesting) for several reasons. First of all, the diminutive book contains entries on only 16 collected specimens, but the entries are incredibly rich and descriptive; I can almost hear her thoughts as she wrote them. Secondly, no years are included. No specific localities (beyond Guatemala) are written. And for the life of me, I could not find biographical information on this woman! Thirdly, her entries include a wealth of information on the native names and uses of plants. Uses of plants range from medicinal, to culinary, to bases for useful products and tools. Title page and entries of field book by Mrs. Wm. Owen, Mrs. William Owen Field Notes from the Department of Botany, undated, SIA Acc. 12-345. Chu-che’ [Indian] This tree has no Spanish name. Its Indian name Chu-Che means bad smelling (Chu) tree (che’), because the branches when broken emit a strong pungent odor. The leaves of this tree after being wilted over embers are burned to the temples to relieve neuralgia. It grows like bamboo or cane putting up shoots from the root until 3 or 4 years old, when it becomes a gnarled and unattractive tree. Of the long straight shoots of the young tree the Indian makes his blow gun (pub-che’). What a great deal of information Owen has provided in a short paragraph! She gives a detailed physical description of the plant, including how it looks at varying stages. Even more interesting is the information she includes regarding the use of the plants by native Guatemalans. No Latin name is given for this plant, but she has indicated the local language name. I especially love the fact that this tree is used for a blowgun. Plant specimen entries by Mrs. Wm. Owen, Mrs. William Owen Field Notes from the Department of Botany, undated, SIA Acc. 12-345. I wish I could find more information on this woman. Was she a botanist? Plant enthusiast? Ethnographer? What years did she work? (Her materials don’t have dates!) What brought her to Guatemala (assuming she emigrated there)? When searching for biographical information on a “Mrs. William Owen” I found some materials on someone who studied Guatemalan folklore, and was married to Captain William Owen—Mrs. Mary Owen. There isn’t enough evidence to be sure it is the same person, but this is my favorite (unfounded) theory. So, I will put this out there for all. Do you know who Mrs. William Owen was? Comment below! Happy Birthday to John Muir! Happy 174th Birthday, John Muir! The Field Book Project team is celebrating a day early; conservationist John Muir was born on April 21, 1838.
Who was John Muir? Muir was perhaps the most influential conservationist in the United States. Muir is credited by the National Park Service, Sierra Club, and many other sources with being the father of the U.S. National Parks. Have you ever enjoyed the natural splendor of Yosemite National Park or Sequoia National Park? If so, you’ve experienced one of the national treasures we have as a direct result of Muir’s efforts. John Muir campaigned tirelessly to establish national parks in order to preserve the pristine beauty of our country. He’s also the founding president of the Sierra Club. In the spirit of Muir, we would like to take a moment to discuss conservation, and the role that field notes may be able to play in research on conserving and sustaining our natural environment. Field notes often include an amazing variety of information that does not get reported in resulting publications. Over the last few years, historic field work and field books have been increasingly used by researchers for a number of conservation efforts including tracking changes in climate and bird migrations. Richard B. Primack, Professor of Biology at Boston University, is using information from a variety of sources including the journals of Henry David Thoreau, along with current field research, to reflect and predict changes in climate and biodiversity in the northeastern United States. The Christmas Bird Count, one of the longest running citizen science programs which collects and records individuals’ observations of wildlife, has been used to predict changes in bird migrations. Researchers at the Benthic Ecology Lab at Smithsonian Environmental Research Center (SERC) have used documentation of a biological survey along the coast of Woods Hole, Massachusetts (1911), to create a map showing the geographical distribution of species and habitats. What about the field books that we are cataloging? The potential is there to use them in conservation work. According to Rusty Russell, Field Book Project Co-PI, the value may be in the descriptions and first hand observations that the field notes provide. John Muir spent significant time documenting the natural wonders of Yosemite, including Mariposa Grove. His published words help the general reader visualize the beloved national park as seen in this quote from Our National Parks. The more famous and better known Mariposa Grove, belonging to the state, lies near the southwest corner of the park, a few miles above Wawona. The sugar pine (Pinus Lambertiana) is first met in the park in open, sunny, flowery woods, at an elevation of about thirty-five hundred feet above the sea, attains full development at a height between five and six thousand feet, and vanishes at the level of eight thousand feet. In many places, especially on the northern slopes of the main ridges between the rivers, it forms the bulk of the forest, but mostly it is intimately associated with its noble companions, above which it towers in glorious majesty on every hill, ridge, and plateau from one extremity of the range to the other, a distance of five hundred miles, the largest, noblest, and most beautiful of all the seventy or eighty species of pine trees in the world, and of all the conifers second only to King Sequoia (page 109). A field book of F. Raymond Fosberg documents the same locations but for a specialized audience. Take this entry, for example, which covers the same territory as Muir’s quote above. Fosberg’s field notes, Yosemite National Park, 1969. From Raymond F. Fosberg field notes from the Department of Botany, SIA Acc. 12-040. That kind of picture could be invaluable. Russell says that one way that field book information could be used is in planning habitat reconstruction. So, we at the Field Book Project wondered, “How else could this information be used”? We are actively seeking examples of how field book notes are used in various types of research, including conservation. If you’d like to share how you use field work documentation, please leave a comment below or email Carolyn Sheffield at SheffieldC@si.edu. Calderon journal entry for April 21, 1976, Department of Botany, Natural Museum of Natural History. from SIA Acc. 12-005. Two of the most dynamic words in the history of science are “explore” and “discover”. Whether in the field or in the lab, exploration begets discovery, both of which feed the powerful drive of scientists to learn. So it was with Cleofé E. Calderon. In 1851, the French botanist Adolphe- Théodore Brongniart described a new genus and species of bambusoid grass, Anomochloa marantoidea, from a specimen being grown in a Paris garden. The seeds from which this plant was raised had an uncertain origin, but were believed to have been collected in coastal Brazil. Although additional plants were cultivated from the original, this species was never again seen in the wild for 125 years. However in 1976, after an earlier but fruitless attempt to relocate this rarity, Smithsonian botanist Cleo Calderon and her Brazilian colleague Talmon S. dos Santos were foraging the understory of cacao plants in the eastern state of Bahia when they encountered the elusive Anomochloa. I am intimately familiar with this story for reasons I’ll explain shortly so, in honor of Women’s History Month, I wanted to tell this tale. In the months preceding the U.S. Bicentennial celebration, Tom Soderstrom, Cleo Calderon and I set out on a ten-week journey to study and collect bamboo in the mata Atlantica of eastern Brazil, an historic refugium and, therefore, a rich and diverse region for bamboo species. Operating out of CEPEC, a cacao research center between the towns of Ilheus and Itabuna, it was decided to form two teams in order to maximize our coverage of the area. Tom, I and two CEPEC assistants would go one way, while Cleo, Talmon and two others would proceed elsewhere. The makeup of these teams was not a surprise to me because, upon beginning my career at the Smithsonian a year earlier, I immediately found myself in Cleo’s bad graces for assuming that her role was more clerical than scientific. Suffice to say that I paid for this error. It was an unforgiveable mistake, so … she never forgave me (sigh). But we maintained a cordial relationship involving minimal conversation. However, I came to greatly respect her research diligence, her work ethic, and her tremendous contribution to Botany through her collecting and publication record. The grass genus Calderonella and many grass species are named in her honor. Back in Brazil, each foray lasted about ten days after which we would reconvene at CEPEC to share our bounty, and return to our hotel in Itabuna to share our stories. Anomochloa was always in the back of our mind as we searched for and collected hundreds of bamboos and smaller bambusoid grasses. On this trip, Cleo was inexaustible according to Talmon, himself a big strapping field veteran. Cleo had stopped smoking the year before and commented often about her improved ability to tromp through the field and climb hills without losing her breath. Then, at the end of our penultimate trip, Tom and I were relaxing at the hotel having returned a day early (I’m sure there was cerveza nearby), when we recognized the beat up black jeep roaring into town with horns blaring. Tom understood immediately. When I learned that Ana Tkabladze, an intern on the Field Book Project, was digitizing Cleo’s field books, I got curious about her record of that trip and, specifically, that historic discovery. First of all, Cleo was fluent in Spanish, her native language as a full-bred, soccer-loving Argentinian, as well as English and Portuguese. Most Brazilians did not even recognize her accent. So, as I began to read her 1976 journal, I was struck with how seamlessly she moved through all three languages, sometimes in the same daily entry. Navigating her field book is, therefore, a bit of a challenge. I thumbed ahead to April 21st, anxious to read her account of the rediscovery of Anomochloa, expecting to find multiple exclamation marks, asterisks or smiley faces. Nope. Collector No. 2381, date, location, distances from landmarks, elevation, and photo numbers, all faithfully recorded per usual. Only one thing distinguished this record. Cleo indicated (n.sp.?) the possibility of this being a new species. Ha! She didn’t assume that she had rediscovered A. marantoidea, but considered the possibility that it was a second, unknown species. She had kept an open mind. Cleo passed away in 2007. Her research relationship with Tom Soderstrom was such that, shortly before he died in 1987, she had left the Smithsonian, never to collect or publish again. But like so many other stories of exploration and discovery, Cleo Calderon’s exploits live on through her collections and field notes. And in our memory. SIA2009-4227. Photograph taken during Mary Agnes Chase’s field work on Pico das Agulhas Negras in Itatiaia National Park [Parque Nacional de Itatiáia], in Brazil. The Field Book Project has made of a point of posting quarterly flickr sets, to highlight some of the great hidden treasures we catalog. In the honor of Women’s History Month, I would like to announce our newest set, featuring images of Mary Agnes Chase and her field work. During the 1920’s and 30’s Mary Agnes Chase conducted field work in the mountains of Brazil collecting grasses now housed in the Department of Botany Herbarium, National Museum of Natural History. Much of her time in the field is documented in correspondence to A. S. Hitchcock and photograph albums she compiled that are now part of Smithsonian Institution Archives Record Unit 229 and Mary Agnes Chase Field Books, 1906-1959 in the National Museum of Natural History, Department of Botany. During her time in Brazil, Chase wrote to Hitchcock discussing challenges, progress, and observations of local life. Chase was a woman of strong opinions and wit, as you will see in the quotes shared below. SIA2009-4229. Photograph taken during Mary Agnes Chase’s field work in the mountains of Brazil. The first quotes are from Chase’s chronicle of her excursion to Serra do Caparaó﻿ (November 19, 1929). During the trip, the trail and overnight camping were made more difficult by persistent rain. SIA2012-3336a. Photograph taken by Mary Agnes Chase, while climbing Itatiáia in Brazil. Chase goes on to describe preparations for the trip up Caparaó﻿, and her struggles to find local guides and staff, recounting the men who refused to assist, stating their belief that if the trip was difficult for men they knew, it would be impossible for women. Chase was a woman of unusual energy and endurance. Despite being in her fifties at the time of her ascent, she climbed several of Brazil’s peaks during her field work throughout the decade. The field work proved challenging, but she persevered with good humor, as shown in the recounting below when she and a female participant reached one the campsites during the climb. Publications about Mary Agnes Chase over the decades have often focused on her dedication to her work, sometimes overshadowing her many other qualities and interests. Late in her life a story was commonly written in several articles about her. The story said that when meeting new people, she would ask "and what grasses do you work on?" If the person didn’t answer in the affirmative, the conversation came to an abrupt end. Chase’s ability to laugh at herself sharply contradicts the characterization of Chase as a serious woman only interested in her botanical specimens. It is this and many other qualities that make Chase a fascinating subject. To see more of Chase’s images, see her Flickr set. Sherwood, John. (January 12, 1977). “Notes on Gentle People and Their Honest Love. “ The Washington Star. National Museum of Natural History. (1978). The Magnificent Foragers : Smithsonian Explorations in the Natural Sciences. Smithsonian Institution, Washington DC. p. 24.